Makeup is not just the face that you put on to encounter the world, it has also become a form of entertainment and sustenance. Much the same way that many get their daily Starbucks fix, suddenly every neighborhood has its own Sephora, Blue Mercury, Rickys or MAC makeup store -- not to even mention all the drugstores, department stores and beauty salons, where one can purchase cosmetics. Coming soon: Manhattan's first Ulta (there are already two of these suburban staples in Queens) to the UES (86th and Third) -- just doors down from Sephora. Let the makeup wars begin! Besides the numerous retail outlets devoted to purchasing cosmetics, the plethora of YouTube tutorials, and the fact that every major and minor celeb seems to have a makeup line, there is no better time than now to acquire some knowledge of makeup's origins. 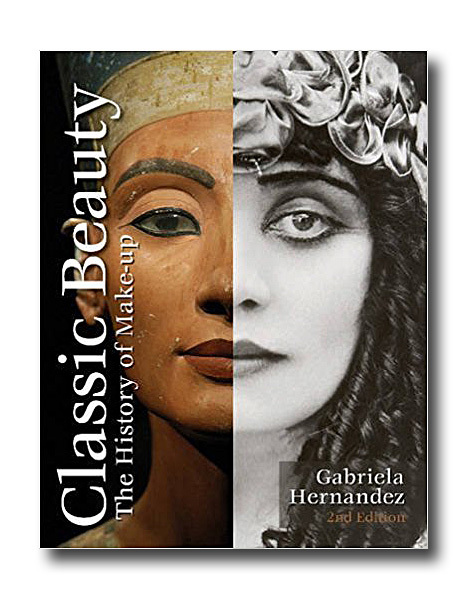 I recently read Classic Beauty: The History of Makeup (2nd Edition) by Gabriela Hernandez, a fascinating compendium of makeup developments and trends through the ages to be released on 5/28 (more info/purchase at Barnes & Noble). The book begins in 33,000 B.C. with the use of face paint as it developed from its usage as a mask against evil figures and spirits to a form of personal adornment and skin protection. Early pigments were derived from mineral oxide ochre powders and lampblack (the soot collected from the smoke of carbon materials) combined with animal fats. Cosmetics in antiquity include Egyptian kohl powder (2659 B.C. to 1070 B.C)made from soot, the mineral Galena, and other ingredients; green eye paint from the mineral malachite, and red ochre used as rouge and lip colorant. Sand mixed with clay and ash was used as an exfoliating scrub and egg and scented oil were mixed to make face masks to protect against the drying sun and insects. The ancient beauty rituals of Greece, Persia and Rome are discussed in this section as well. Chronologically the book details beauty in each historical era and how events in history directly shaped the fashion and makeup styles of the day. Each culture had its own beauty products -- the Norse used colorful tattoos, the Vikings brought aromatics to Europe from the Arab world, the Byzantines used rock-crystal cosmetic jars with jeweled lids and wore fragrance in crescent shaped earrings, the Crusaders brought blonde and black hair dye into fashion but not red hair which connotes prostitution and witchcraft, and Jewish traders circulated spices, dyes, ointments, and perfumes after the Crusades. From the Medieval period to the Middle Ages, the Sixteenth through Nineteenth Centuries, each age is detailed with a timeline page. World events in Europe and eventually America, are presented with special attention to how these events impacted the creation and use of cosmetics, beauty rituals and hygiene customs complete with beautiful illustrations and photographs of early beauty icons. 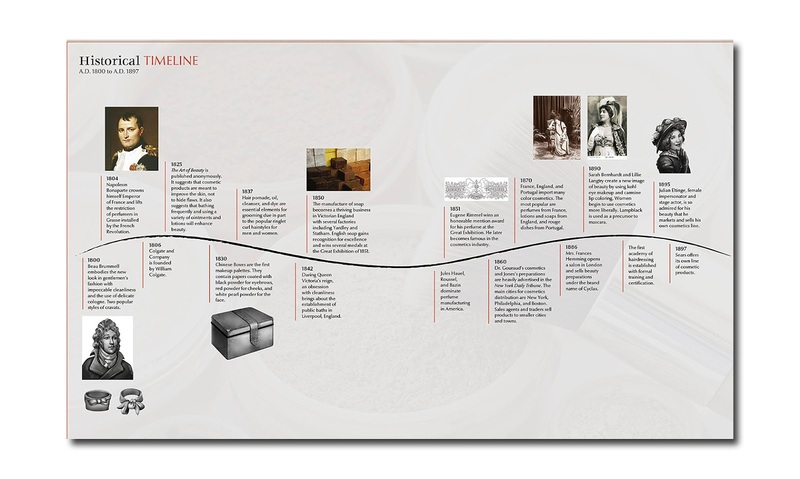 Before the onset of any governmental regulation of cosmetics some of these early discoveries were actually poisonous including ceruse, a skin whitening powder popular among the aristocracy, produced by applying vinegar to sheets of lead and scraping off the resulting "bloom." A pale complexion was so desired that even though ceruse ruined the skin, its toxicity eventually killing many society women, it continued to be used. Another less drastic example of the importance of makeup occurred during the world wars when cosmetics were less available in America, yet women (often those who worked in factories to promote the war effort) went out of their way to wear lipstick, as a morale booster both for themselves and others. Even in current times, much has been made of the fact that in a recession, women will cut back on the purchase of clothing but they will continue to spend on cosmetics. 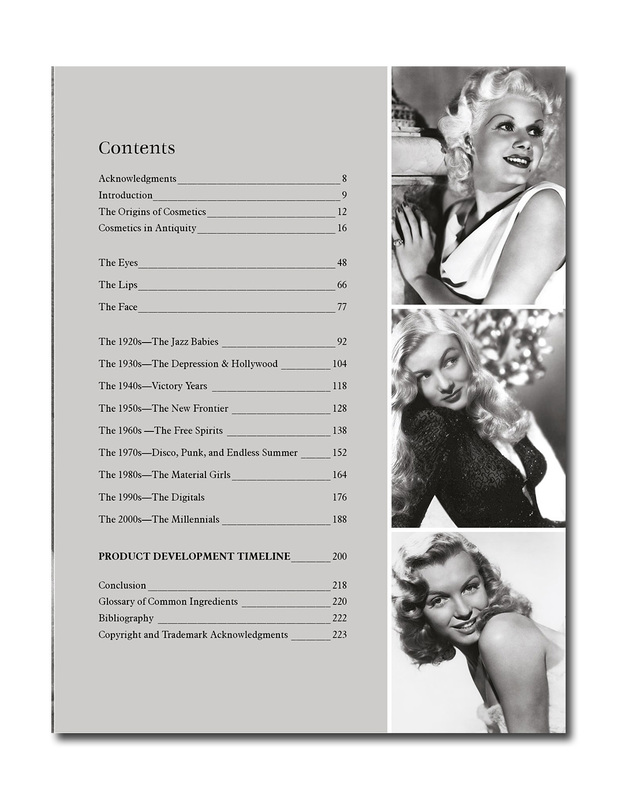 After abbreviated sections focusing on the eyes, the lips and the face throughout history, the book breaks down the looks of the 20th and early 21st Century America by decade including the invention of important modern day staples such as the swivel lipstick case, the automatic mascara wand and the eyelash curler. In this section you'll also see magazine advertisements for various products, many of which I remember from the 60's and 70's. It's interesting to compare ads from that time which felt the need to explain the products efficacy and why you needed it, to the modern day ads which are much cleaner, often practically without any copy, sometimes not even featuring the product itself. Ads today resemble Instagram where the images are thought to be worth a thousand words and words are superfluous. Each decade follows a format which includes a photo of the prevailing look of the day, a brief history of events both historical and social, that had an impact on the fashion and beauty style, decade highlights, a diagram of the application of placement on the face, swatches from a color palette, as well as a focus on popular products including nail and hair preparations. 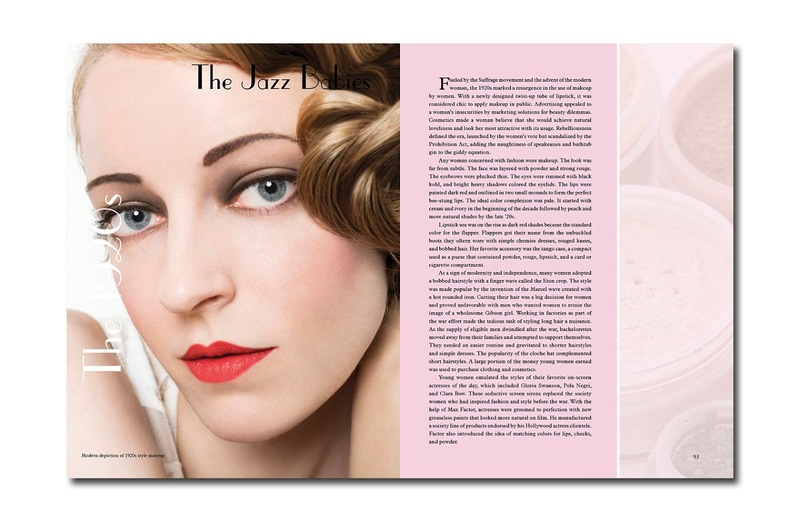 Interestingly, the photos used here are from actual vintage cosmetics that the author owns and continues to collect. I especially loved this section, particularly the '70s -- the decade when I first started experimenting with makeup. Much like reminiscing over clothing choices from back in the day, many of the makeup selections here -- Yardley lilac watercolor paint-on eye shadow for example -- brought back (sometimes cringe worthy memories) but at least I can see that I was right on trend! I find it fascinating that makeup trends are so pervasive in our culture that they can be pigeon holed this way, despite individual adaptations. 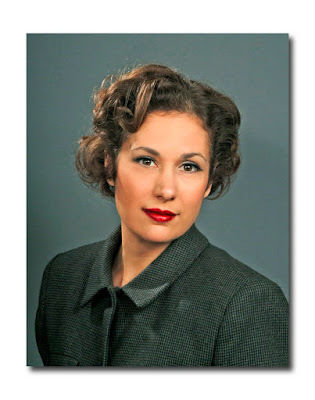 About the Author: Gabriela Hernandez is the founder and CEO of Besame Cosmetics as well as an artist, photographer and cosmetics historian who consults with film and television productions for historically accurate makeup looks. Hernandez concludes with her theory on why we should make an effort to care about beauty. "Feeling groomed and well cared for is a daily mood booster; inspiring us to be our best when we look our best," she writes. It also helps us to retrace the past: "I am convinced that when we pencil our lash-line and redden our lips, we are connecting with human beings who did the same thousands of years ago."